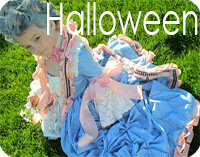 Grosgrain: Twilight Tide Pettiskirt GIVEAWAY!!!!!!! CLOSED. Twilight Tide Pettiskirt GIVEAWAY!!!!!!! CLOSED. Since my last pettiskirt giveaway had such an amazing response I decided to make another one to give away. Who knows, this could become a regular thing! This time I made a black skirt. I chose black because I had a couple commenters tell me that they strangely wanted black. My first instinct was to think....black, ugh, no way. Then I thought about it some more and looked at few photos of the black skirts and found myself strangely liking them too! Besides the fact that they are a deviation from the normal pettiskirt hues, I think they look GREAT paired with BRIGHT rainbow colors to offset the dark tone. Which is why I chose these pieces to couple with the skirt. The boots were the perfect touch. I bought them at Target for $16.99. The rainbow stockings were borrowed from a Rainbow Brite halloween costume. I bought the tank top at Walmart for only $3. That deal was so good I bought one in every color and the jacket was a gift from a friend who worked at The Children's Place. Here's a little secret....it's actually for Molly but I thought it looked like a cool cropped jacket for Lily. It seemed to fit her shoulder width which is the most important part. I don't think you should feel trapped by label sizes with children's clothing, especially skirts. Sometimes, cropped looks better! I had originally wanted to photograph Lily stomping in a deep puddle during a rainstorm and yesterday would have been the perfect day. BUT FOR, the fact that it is still pretty cold here when the sun is hiding. So that was out of the question. I'll have to save that idea for a nice hot summer evening. You know, the sort of rain and heat that makes steam rise from the pavement. God I miss summer. Oh I almost forgot, I bought the umbrella at Urban Outfitters. You might not be able to tell from the photos but it is one of those umbrellas that have a bell shape so less rain can fly in your face. Not only is it fashionable BUT FUNCTIONAL! Later, Lily and I went to Rita's Italian Ice and bought some chocolate custard. Speaking of Rita's did any of you pay them a visit for their 'first day of spring' free ice day? I'm sure some of you might have a chain where you live. I did, and found it to be quite impractical. Well, as usual the first day of spring was freezing. So what did we do? We all huddled in ridiculously long lines, in light jackets and sipped on warm, toasty, ICE! And then, did we at least gather indoors to eat our reward? No. Because Rita's doesn't have an 'indoors'. All of this was under the guise of 'free'. And in case you all are scolding me for complaining about something that is 'free'. I have to forewarn you that Lily (and myself) don't really like Italian ice and ordered custard instead which of course, was not....free. As I mentioned in the last post, Kaiya Eve's instructions were not very thorough, left out a lot of details and (I forgot to mention) were only for an 18-month old. If you found these things out the hard way, I can truly empathize! But a fellow blogger and pettiskirt maker, Kerri Krueger has created a very thorough tutorial to recreate a boutique-style pettiskirt in sizes 3 months thru 12 years. She sells them through her site. You can purchase it here. Then get out your sewing machine and make a hundred for just the cost of material! 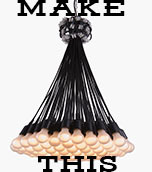 If you're on the fence about purchasing the tutorial, keep in mind that it includes some good tips that will shorten the time it takes you to make a pettiskirt as well as improve the quality. And that is priceless! Kerri also answers all questions about the the tutorial within 24 hours. Be sure to look for lots of new giveaways next week. Brian is wrapped up in his fantasy baseball league all weekend so I will have some time to myself to sew, sew, sew. Oh and by the way, I named this the twilight tide pettiskirt because, to me, not only does the ruffle fluff at the bottom look like the spray on ocean tides but it feels soft and foamy to the touch. Last day for posts is Wednesday 4/08/09. Winner will be announced Friday! As usual, if you would like a chance to win this pettiskirt just link back to this post. If you have any questions see the "questions and answers" link to the right. If you use blogger just use the "create a link" link at the bottom of this post. If you don't use blogger, that's fine too. Just create a link on your page as you normally would and I will see it using Technorati. I love it!! 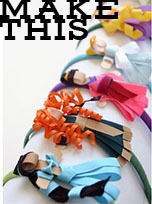 I will have to check out the instructions I want to make one of these for my daughters birthday. I'm linking it. I love these pictures because she is wearing the same boots my daughter wears every day! She loves those things. That outfit is so Abi. She'd love it. It's absolutely gorgeous...both my girls would not look at any other item in thier wardrobe if this was within their reach...I'd love it for myself too! Have linked you on my blog. I nominated you for the Splash award! See my post here. SO cute. I have been wanting one for a while. How dang cute is this. I love, love it. You are so talented, that had to take some time. Cute! I'd like to make a brightly colored one for photographing little girls. But... how do we know who wins? The winners section hasn't been updated since early February - and I'm still hoping I win the paper crane frock! so so so so cute! I'm in! OOH how I wish I had one of these ... I hope miss Lucy Mitchell wins! Very cute - will definitely have to check out the tutorial to purchase! I linked it on my blog. Oh and I LOVE this tights. I am going to have to look on eBay for this rainbow bright lovelies! So cute ~ my little grandbabies need this for the first deposit into their dress-up chest! Thaks for the opportunity to win it. I really enjoy your blog! I linked to this giveaway! Another beauty! I even have the perfect accessories to go with it already, including a CP denim jacket that probably would fit my 3 year old about the same way AND some great colorful tights AND some awesome black galoshes with multi-colored polka dots. I'm telling you, the pettiskirt would have a happy, happy home at my house!! I'm so in love with these skirts especially this version. My rocker little girl will love it if she is the lucky one! Whoopee, another chance! Thank you, I only hope I'm doing it right! I love this skirt and your daughter is gorgeous! I wish I could sew...oh well. I added my link! I need to learn to sew better. These are so to die for cute, I want one so bad! I am linking it!! This is sooo adorable I want to win! Pick me! Okay, I just ordered material to attempt making my own, but I REALLY WANT THAT SKIRT! PLUS, my daughter already has those boots, see it's a match made in heaven!! AHHHH! Love it as always. And those boots are the best! My 4-yr old son is already on his second pair (bought from Target as well - though only $14.99 here in Utah). He wears them in our back orchard and swears that the little eyes help him seek out the monsters lurking in the brush. Oh to be 4 again! (ryanandcynthia.blogspot.com)! My little girl would love to give this skirt a twirl. ABSOLUTELY GORGEOUS!!!! No other words really!! My nearly 2 year old would LURVE one of these!! like to be drama princesses sometimes. I have created a link so please enter me. What a lovely idea! I'm 60...when I was a little girl it was all about can-cans...which this puts me in mind of. My sis sewed them up for me in colors to match all my skirts...nylon net with lots of ruffles made from the same net...lots of gathering to make them full and stand out to hold my gathered skirts out just so. It's just precious. 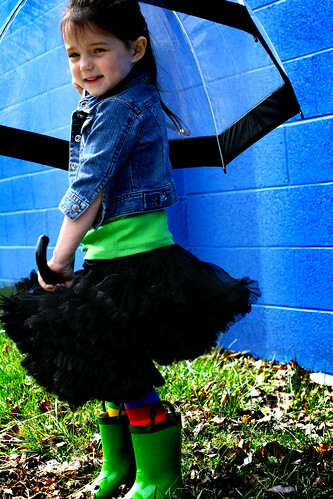 I love it with those bright colors and boots! I love these skirts. I also really love Rita's and only go for the custard. I could do without the Italian ice. Oh, just love, love, love this! Great pics too! Love the periwinkle blue in the background too. I love the black, very unique! I linked you. ;) My little lady is in love with this as well...oh the possibilities! I agree- the black with the bright colors is the perfect contrast- especially that green- I am in love with that color green this spring! Very cute! I linked up! I LOVE this! My daughter would have so much fun in it! PS. Your daughter is so cute! These are my favorite. You do such a great job! Ohhhh please!! it's so beautiful!!! I love it!! I"m linking it. This skirt is adorable. I love it. my daughter would look adorble in it. Strangely enough, I LOVE this skirt in black as well. Black is not usually my thing, but I love the way it looks paired with the boots and the bright colors. It is just too much fun! Absolutely love it! I linked this to my page. And I love the pictures as well! OOOOOOOOH! I so want to win this one!!! I absolutely love the black. 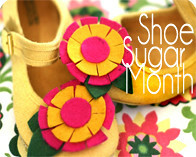 Link love coming your way in my GrosGrain Spotlight! It's insane how bad I want this. Truly bordering on creepy stalker. 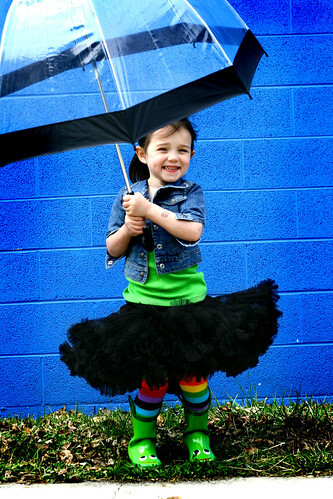 My daughters would probably tear each other apart over who could wear it, but it would be worth it ;) And those boots, stockings, and umbrella are too stinkin' adorable! love it, my little abby will need one!! It's wonderful!!!!!!! I love it... and my daughter'd love it too, I'm sure!!!!! Thanks for letting us dreaming!!!!! Love it! They are so cute. I linked it too, just like all the others. Hope I win! I love this so much! More than happy to link from my page! OHHHHHH You OUT-DONE yourself on this one!!! It is gorgeous and I LOVE the pictures you took! Thanks for sharing this with us! I'm linked, and have you in my blog roll as always! Linking it. How stinking cute. Crossing fingers! Just linked on my blog. so utterly adorable!! My almost two year old sister would LOVE this!!!! You are linked! what a very cute skirt!!!! 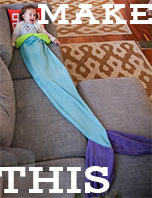 I would love this for my Lily. I can't seem to make the link work this time? any help? Also I was wondering when you were going to announce winners for your other give aways? I linked to my site! i love your work!! Oh my word I have 4 girkls and Have loved these forever! I wish to win! I just bought tights that are bright tie die, they are red and yellow. From We Love Colors. They would look so lovely under this pretty skirt! I just linked, hopefully I did it correctly. First time to your site, love it. I hope I wind. Love the skirt in black!!! One of these days I will mae one, gut till then I will keep trying to win one! I love the pettiskirts and thanks for the link to the pdf pattern...I just might have to purchase one now. I wrote another post about you on my blog: http://melissaburford.typepad.com/burford_designs/2009/03/twilight-tide-pettiskirt-giveaway.html Thanks for the chance to win!!! so so so cute. Love it. 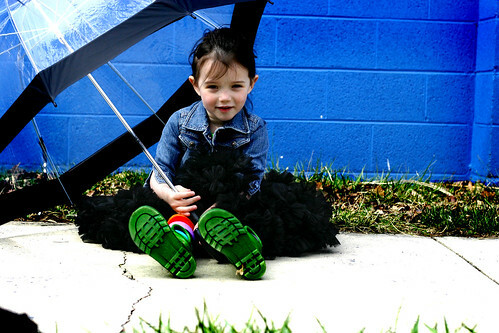 Oh my this is amazingly adorable :O) i have a soft spot for tutus and pettiskirts....so this one is right up my ally! i can't believe what a steal those tops and boots were. i always love a good deal to! love it - created a link yesterday - thanks again for a chance to win! happy Sunday. Oh I love it! I have wanted a pettiskirt for one of my girls for so long. I love the chance to win! What a cute pettiskirt. I don't have any of these but I would love to see one of my daughters in one. Love the color too...it's so different. Again... I love love love it! I hope to win, I could definately get some use out of it with three daughters of my own! Great work yet again! So cute! I had nnever seen a black pettiskirt before and I am now a huge fan! So cute, my oldest would love it. Wow! Beautiful! i was reluctant to dress my daughter in black, but she just looks SO good in black. The first thing i tried in black was a gift from someone - a black corduroy jumper. After i saw how great she looked, i bought a black and white dress for christmas, lots of black tights, a black and white print short sleeve dress that looks great over a turtleneck and leggings. It goes on and on, and so do I :) I agree with you that black just makes other colors pop. This is gorgeous!! Can I buy one if I don't win? I'd love to get one! I'm back and in love with the black. I also posted for the pink one a while back. Hopefully black is my lucky color. Love it!! For the love! This is so awesome and it would be so fun to wear. I love pettiskirts, in any color. This one is simply adorable! I can't you have time to make all these things for giveaways. You are too generous. But I did blog about it. Couldn't get the "create a link" to work but it's there. Thanks for the continuous giveaways!! love the skirt great work again I dont see how you do it you are Amazing! Oh May Goodness! We just watched Twilight last night. Read all the books over Christmas break. Love you blog, especially the time you take in photographing your products. They are so fun to see. They really get my creative juices flowing. Thank you for all your work and inspiration. Very cute and generous too. Perfect for a mom of four daughters (uh, that be me ). 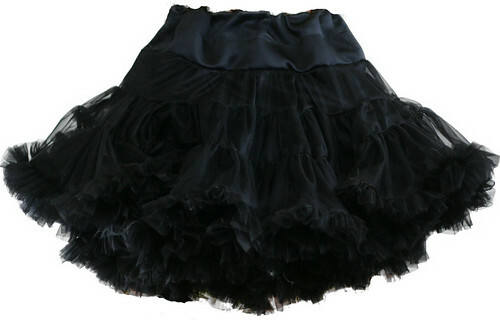 Love the black pettiskirt because it goes with everything, I would so love to have it. Not only do I love it but I also love Twilight. It is on my blog! What a stinking cute idea! 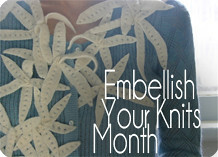 I'm linking to it right now at www.larksongknits.com! Love the green paired with the black skirt. My girls would LOVE it. hmm, my first comment got lost somehow - trying again! i will link right now to my blog at www.larksongknits.com! i love the green paired with the black skirt. my girls would love it! Very Cute!!! I posted a link! Up until now, I have been a silent reader. But, I love the black with the bright colors and would love to win it! I've created a link. Until now, I have been a silent reader. I love this pettiskirt, and would love a chance to win it. Nothing screams "PRINCESS" more than this does! I LOVE IT! btw, can you blog about the tutorial for this skirt? Love the Pettiskirt! Am going to attempt to make a newborn one for some pics of my newest niece ~ she is due to make her debut in August. Lovin it!! I didn't win the last one so I will try ...try ...try again. I hope to get a sewing machine for my bday and maybe i can learn a thing or two! These are so cute and so fun!! My daughter would love it! 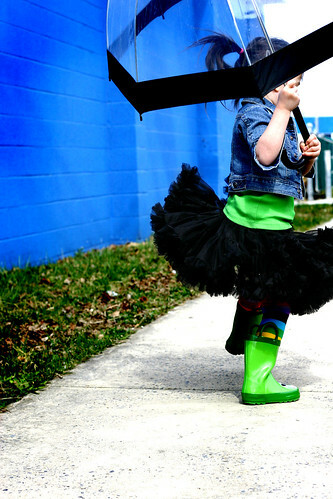 I am looking for some great rain boots as well...no luck yet for her size. You are so talented! what a cute skirt! I'd love one to give my granddaughter!! Oh these skirts are just fabulous!!! And the black one would go with everything! I want this skirt! Very cute. I want this skirt! Very cute! And I love the black too! Gorgeous! I would love it for photo shoots and my girls would dig it for dressing up. I linked it on my blog. i LOVE it. i would love to win this one!! That's perfect! I can't believe it looks so good in black! You are amazing with the sewing machine! So, so, so cute and as always, great photos!!! my little princess will LOVE this! 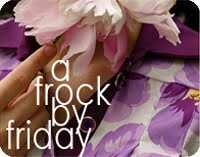 I've linked you up and just need to say that everything on your site is so beautiful!!! The photographs for this giveaway are AWESOME! I am lovin the black with the brights and the stripes and that fabulous blue wall! Keep doing everything exactly the way you do it! I am just starting my crafty blog so it is not much to look at yet. Love the pettiskirt, and your daughter is adorable! ( I have 3 girls). we ♥ pettiskirts!!! Oh my gosh, how cute! My daughter would love this. Just linked it on my blog! So cute...black and fluffy...PERFECT. SO FUN! I must visit target for those boots. Love it!!! The pictures are so cute...the lime and black look wonderful together. Off to walmart and target for green! Just linked to my blog. Thanks! I don't know if I can play from France but I try and I will improve my english looking your lovely blog ! So, I'm linking it ! It's so adorable that I blogged about your giveaway.. I think this skirt is jut A-DOR-A-BLE!!! The is one of the cutest skirts I have ever seen. I need to get the tutorial myself. so cute! Love this skirt. Love it in black too! I have to link this, then I'm off to buy the pattern. My 5yo loves to twirl and grandma loves to sew. Have you met my daughter? because you made this skirt for her! Must have it!!!! your creativity makes me smile every time. Thank you for giving us another chance. I love the frill. ppplease let me win! You are, as always, linked on my blog! Oh my I love the black! I never thought I would, but I love what you paired it with. This would be well used by either my daughter, or one of our two babies (one by birth, one by adoption) to come. Oh how I want this for my little girl and for photo shoots. You're awesome!! Wow, what a cute skirt! My little dancer girl would love it so much!!! Just too adorable! My grand-daughter would love this! So i thought I loved the pink & red one.... BUT I can not live without the BLACK one. It is to die for. You are so talented, I keep telling myself I will make more time for projects, one day. Anyway- we would love to have it. It is practically worn in already & and am just thinking about all the fun my 2 girls would have with it. I thought I loved the pink & red one.... BUT the black. It is fabulous, I can't live without it. You are so talented, I keep telling myself I will do more projects, one day. Anyway, is it practically broken in already and I am only thinking about how much fun my 2 girls would have with it. OOOoooohhh...must. have. this. skirt! I'm one of those "crazy" gals that secretly always wanted a black pettiskirt to try on my girls!!! I absolutely loooooove it! I linked it right away. The contrasting colors were perfect! Too cute! My sweet and oh so adorable cousin would look absolutely beautiful in this pettiskirt. I can see her twirling around for hours wearing her favorite red shoes. Thanks for chance. SO DARLING! LOVE LOVE LOVE the black! I have 3 girls who would ALL love this! Love, Love, LOVE the photos! and the petticoat is fabulous too! oh. my. gosh! i love, love, love this! i have been patiently waiting to get one for my little girl & to use for my photography! i LOVE that its black! so unique & fun!!! i am definitely linking this!!! So pretty. Shame I have no girls! How cute is that?!?! I love it!! I definately linked you! Super cute!!! I've linked in. My daughter thought it was so great she totally wants one now. She is home from school with a kidney infection and a cold sore in her eye that is attacking her cornia. It has been a bad week already. Winning this would definately make it better!! I absolutely love this. I love adding bright colors with blacks, browns, whites. Teagon would never take it off. SOOOOO CUTTTTTEEEEE!!!!!!! the black is DELICIOUS!!! I want I want!! And if I can't win then I will HAVE to make it myself! GORGEOUS! Oh we LOVE them!!! I post a link on my blog!!! Absolutely gorgeous!!! Fantastic pictures too!!! Oh I hope I did that right I hit the creat a link and left a post on my blog but I don't see it showing up on YOUR page. hmmm I never did that before. I really LOVE the skirt. I think my daughter would look darling in it. oh goodness! i would LOVE that for my little Scarlette! its ADORABLE!!! i hope hope hope we get it!!! My Zoe would love, Love, LOVE this. She's my little twirler and dancer girl. Adding the post to my blog right now. very cute! and black goes with anything!! 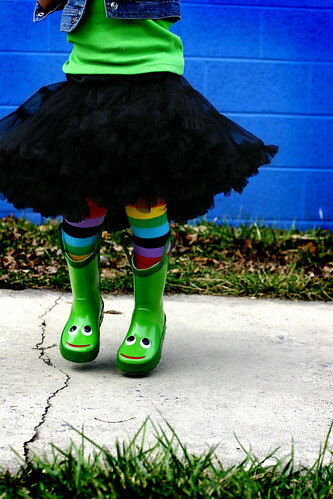 It would also look very cute on my daughter with her pink princess rubber boots!! My 4 yr old granddaughter got some pink cowgirl boots on her visit to TX over Christmas. I also gave her the jean jacket her mom wore at her age and the black petticoat is a "must" addition to her wardrobe!!! Love it. Want one! My link is not showing up here but is on my blog! The skirt is to die for!! LOVE IT!! I can't fin my link in "Links to this post" so I'm wondering if everything is OK with my blog. Please, can you check it. Sorry for my english ! I am in LOVE! Super-duper cute! I would love this for my E and then I won't have to sew it. and i just bought lime green sandles for my little princess... perfect ! I am so loving it! Thanks for the link to the pattern. I'll have to see whether my iffy sewing skills are up to tackling it. Thanks! I have been dying to make one of these. It amazes me how you seem to just whip these things together! My daughter would looooove this! omg, I LOVE LOVE it. I love patterned tights and this is the perfect skirt for them!! beautiful! I found your blog last night while out browsing and love your blog. I have linked to your petticoat giveaway. My daughter would love a twirly skirt like this. I wish I could just buy one, my 3 year old cry's when I tell her we can't afford it, But I know she doesn't understand. My daughter would love this. It is adorable. I added a link on my blog but it is not showing up on yours. Anyways thanks for the chance to win! wow. beautiful!! my daughter would freak over this. hope to win. Both my girls would absolutely enjoy this. Both of them are the same size even though they are 18 months apart. I hope this is sufficient. HOW BEAUTIFUL!!!!!!! I WOULD LOVE TO LEARN HOW TO MAKE A PETTISKIRT-thought I'm not the best sewer yet!!! lol You are amazing!!! THanks for the chance of winning one!! I just linked it, but I don't see it showing up on your blog! This is seriously the prettiest pettiskirt!! You are amazing!! Great pictures and the colors are so fun to look at! 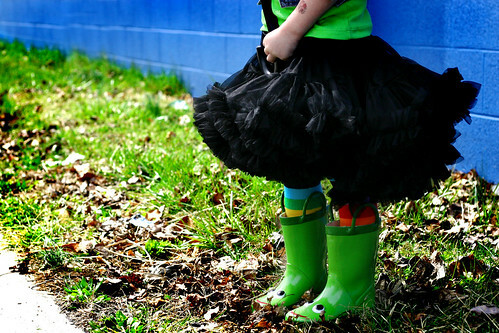 My little one has those exact wellies, we call them greenies! love this pettiskirt. would love to win it. i tried to post already but didn't see it. Love Love Love it! Would love to get it for my daughter. I already posted about it on my blog. I love the skirt. It is so CUTE. I love this! My daughter would love it! So perfect. I am planning on making one for my daughter for her 4 year pictures. What a cute idea for those pictures. Love it! I'd pair it with bright colors too! So adorable!